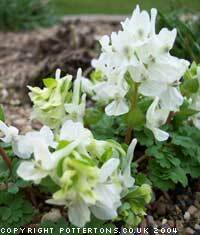 Dense short spikes early in spring of large, creamy-white flowers above a compact blue-green dissected foliage. Easy throughout the alpine garden, this beautiful charming plant has a habit of gently self seeding but never becomes a nuisance. Limited availability.